Starting this summer, groundbreaking will begin on a long-dreamed-of energy project that’s become possible only recently thanks to advances in technology: a high-tech link that will finally connect the US’s three major electricity grids into one. 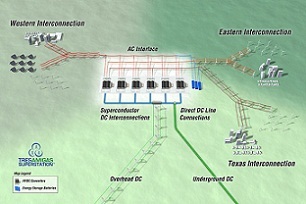 The Tres Amigas project will connect three grids that currently operate as virtual energy islands: the Eastern Interconnection, the Western Interconnection and the Texas Interconnection, also known as ERCOT (for the “Electric Reliability Council of Texas”). Up until now, little power — only about 2 gigawatts in total — could be transferred from any one of these grids to another. Linking the three regional grids together will increase that amount considerably in years to come, enabling all three systems to become both more efficient and resilient. Tres Amigas, which is Spanish for “three (female) friends,” will also make it easier for renewable energy developers to sell the electricity they generate to regions outside their existing markets. That should provide a new boost for further renewables projects, as development in some areas has been constrained by a lack of adequate transmission capacity. For example, solar energy operators in remote, low-demand parts of the Southwest could send their electricity to markets in more populous and energy-hungry regions on the East Coast. The Tres Amigas “SuperStation” project wouldn’t have been possible just five years ago, according to chief operating officer David Stidham. The initiative relies on cutting-edge Voltage Source Converters, or VSCs, that can efficiently connect two or more asynchronous grids by converting alternating current (AC) power from one network into direct current (DC) power and then back into AC power that’s fed into another grid. It also depends upon advanced software that can keep track of fast-changing energy prices, as well as production and demand, across multiple markets. The last piece that fell into place to make the project possible is the planned addition of new transmission lines near the New Mexico-Texas border that brings the three regional grids closer together than they’ve ever been. Chairman, president and CEO Phil Harris, a veteran energy industry executive, conceived of the Tres Amigas project while working in China to help develop that country’s massive buildout of high-voltage direct current transmission systems. Upon returning to the US, he began making plans in 2008 to connect America’s three regional grids. While it’s now possible, the project will be no mean feat, requiring the help and cooperation of many partners with different types of expertise. Among those that have come on board are American Superconductor Corporation, which will provide the necessary superconductor electricity pipelines; Viridity Energy, which will design, build and operate Tres Amigas’ power trading platform; Alstom, which is supplying the VSCs; and Xtreme Power, which will provide utility-scale power management and energy storage for the new hub. Located on 22.5 square miles of land in Clovis, New Mexico, the Tres Amigas SuperStation is set to have its first link — a 750-megawatt VSC connecting PNM and Xcel Energy — up and running by the summer of 2014. More connections will come online over time, with the project eventually expected to offer up to 30 gigawatts of power transfer capacity.